The Dove's Corner: Dear Maggi,..till we meet Again ! Indian origins-but being just another ready made snack brought into the Indian market a few decades ago by a foreign company actually ending up becoming such a meaningful symbol of a meal, - do I realize and feel amazed at the potential impact that any consumer good can have on our lives- cutting across all human barriers of religion, beliefs, traditions, money and education. their normal state of things! have set stronger precedents of taking over our emotional domains! geography, religion or language has been invariably restricting the impact. However proud we may be of our own indigenous snacks like Samosas, or Dosas, or Rasgullas or Jalebi,..which have even made a mark in other countries; fact remains that within India , not even one of these can actually be termed as being popular to the extent that they could boast of being omnipresent in each and every family in every part of the country ,and unless amply modified as per local sentiments ,they stand but little chance. Either they are completely absent in certain States of India or are eaten only after they have been prepared with necessary inclusions and exclusions, and are largely seen as quintessential representative of a particular State only. So much so that when there occurs that oft repeated celebration of the common rift dividing us Indians , many proudly claiming their heritage ,their Statehood or more specifically their regionalism- the differences between North Indians and South Indians, Easterners and Westerners;even the sweets and snacks aren’t left out. Thus far from being a unifying factor, many a time they end up encouraging some divisive mind-sets! 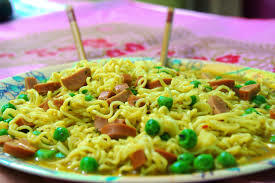 But to our utmost relief and endless delight , there has been something about Maggi that has successfully managed overcoming all possible human barriers, bridging all gaps helping it become the most widely accepted and savoured food item in almost every household and bachelors’ den alike…….across the entire length and breadth of the country, too ! Yes, there are instances where people do enjoy making it with their own Desi touch, sometimes adding Desi-tadka, sometimes, adding Sev-Bhujiya…and whatever other interesting combination at that,….but the overall affection and the whole hearted acceptance largely remains intact. whole heartedly embraced by the rich and poor alike ! out on their own would at least make themselves a packet of Maggi , now feel extremely bothered. Many young just married couples who at least had a backup in the form of Maggi that served well incase nothing worked out to please the appetite of their better halves, have started feeling insecure ! 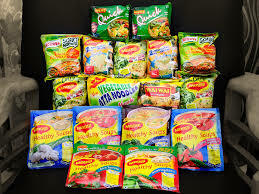 So many people have such wonderful memories to cherish when they look back at romantic stories and experiences of having dished out their best plate of Maggi for their loved ones…and so many wonderful relationships – be it with friends, be it among couples or work related, have blossomed over the years, thanks to Maggi. It was also a sign of independence and self-sufficiency, for many busy workaholics ..
Brimming with mixed emotions myself, I can’t do much of sensible research at the moment, but to safely conclude and provide some rest to my restless soul, I can comment on what went behind the success of Maggi - no it was not the “Divide and Rule” philosophy practised successfully years ago by the Britishers , and still very much in vogue among the fraternity of some modern day vested politicians , but instead this time it has gladly been the sentiment of Unifying one and all - through a common thread - through the most important quality of this product - “Convenience” with “Cost Effectiveness”, which instantly struck the right chord with the tummy, hearts and heads of the Bharatiya Janata. packets costing just tens and twenties, ensured it reached even the less privileged ones ! What a powerful statement of having achieved Unity in Diversity…. A big round of applause of course for the intelligent marketers who managed the image of Maggi and positioned it so well for almost three decades ---they never let it appear so common that it would stand disowned by the upper classes –….and at the same time, kept it somewhat aspirational for the poorest households ! Not to miss on their powerful television ad campaigns which so successfully captured the emotions of one and all…., and when endorsed by Bollywood icons of the stature of none other than Big B and Madhuri Dixit…who can but , escape the charm ! There cannot be any such other success story ….